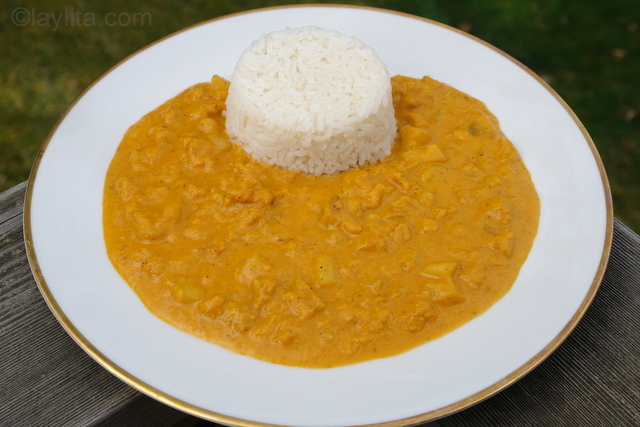 Guatita is an Ecuadorian stew made with tripe cooked in a sauce of potatoes and peanuts. Guatita is one of those dishes that causes predictable reactions: 1) if you’ve had it before you will look at it and your mouth will water (assuming you liked it when you had it). 2) if you haven’t ever had it before and don’t like the idea of eating cow’s stomach or tripe or if you had tripe cook in a different way and didn’t like it, then you might say yuck. Finally 3) if you’ve had tripe before and liked it you might be tempted to try this dish. I’ve had tripe in other dishes and I’ve liked it, but it’s one of those ingredients that I can only eat a small amount of because the flavor is very strong. However, tripe prepared this way in a potato peanut sauce and served with rice and pickled onions is just amazing and I can eat a lot of it. The tripe is cooked and then cut into very small pieces so you aren’t overpowered by the strong distinct taste it has, and the flavor blends in with the taste of the potato peanut sauce. 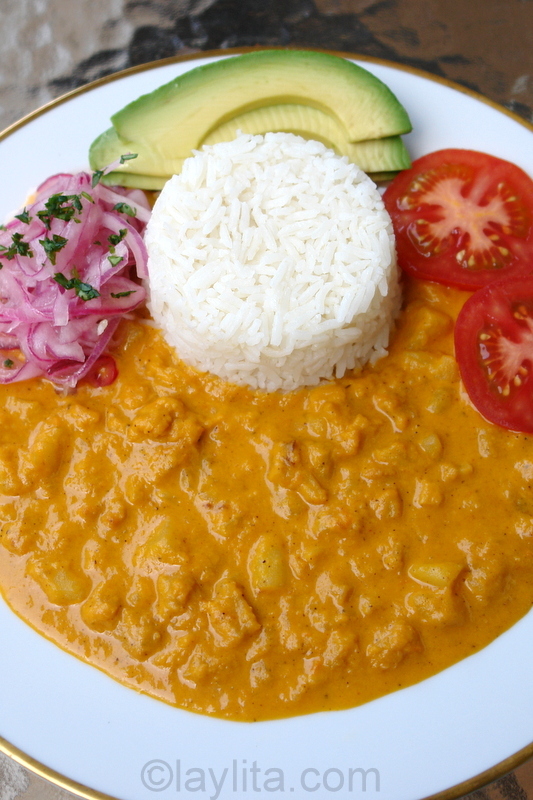 Ecuadorian guatita tripe stew is served with white rice, curtido or a pickled onions, tomato slices, avocado slices and hot sauce. 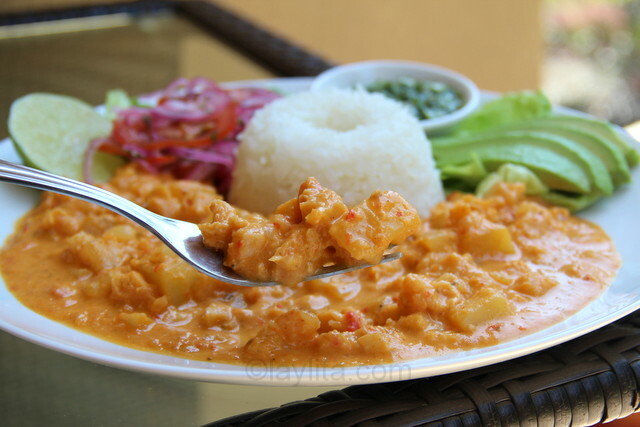 Ecuadorian guatita is a traditional dish of beef tripe stew with potatoes cooked in a delicous peanut sauce. Cover the tripe with juice from half of the lemon, water and salt, let rest for 10 minutes and repeat. Rinse well the last time. In a large stock pot, cover the tripe with 10 cups of water, cilantro sprigs, garlic, salt, and cumin, bring to a boil, reduce temperature and simmer until tender, about 2 hours, drain and save 2 cups of the broth. Mix the peanut butter with ½ cup of milk to soften it (so that it mixes in better later). Dice the tripe into small pieces. Prepare a refrito with the butter, achiote, cumin, salt, oregano, chopped onion, bell pepper, tomato and garlic, cook until the onions are translucent and soft, about 5 minutes. Blend the refrito, remaining milk and peanut butter sauce to obtain a smooth sauce. Place the blended sauce, the 2 cups of reserved tripe broth, the diced potatoes and diced tripe in a large stockpot. Bring to a boil, reduce temperature and simmer until the potatoes are tender and the sauce starts to thicken, about 25 minutes. Lightly mash some of the potatoes to help thicken the sauce. 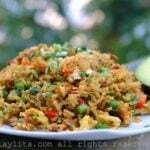 Serve with white rice, onion curtido, tomato slices, avocado slices and a good hot sauce. Don't like tripe? You can also try this dish using canned tuna fish, chicken or seitan (vegetarian meat) as an alternative. Guatita is a typical dish from Ecuador and yes, like most of our typical dishes, it is also known as a great hangover cure (I swear we are not a country of alcoholics, we just like swift recuperation for the occasional time we do drink). 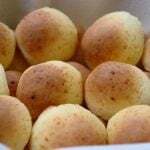 In each city, there are restaurants that are known for being the best places to eat guatita, and if you go by one of these restaurants on a Saturday or Sunday morning, you will find them completely packed. My mom, during her vegetarian phase, used to make this dish with seitan or vegetarian wheat meat. It was one of the few ways she could get us to eat it and it was mainly because the potato and peanut sauce were so tasty. So if you’re looking for an alternative to tripe you can replace it with other ingredients, I’ve made it with tuna (one of those days that I was craving it and only had potatoes , peanut butter and a can of tuna fish available) and it was good; but even if you just want to try tripe once out of curiosity or are ready to give tripe a second chance I recommend that you try this dish, be adventurous as Nicolas (my husband) would say. I love Ecuadorian dishes! Living in Florida, it’s been hard to find a good authentic restaurant. I’m glad I found your page so I can embrace my culture. Quick question, how many servings is the Guatita recipe for? It’s for about 8 people (Ecuadorian style serving), you can stretch it to 10-12 people for a smaller serving size. I have been using your recipes for over a year now they are all terrific. 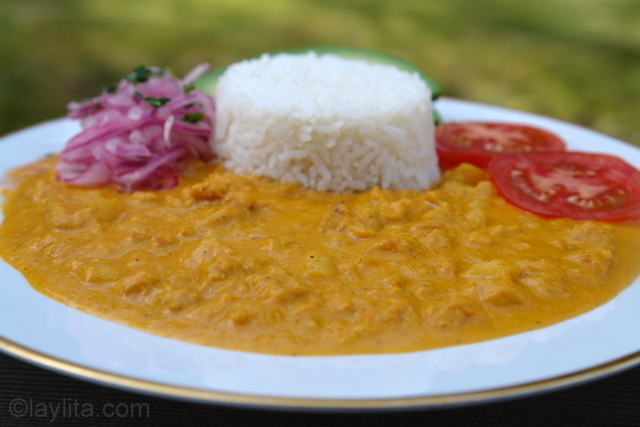 My husband is from Pallatanga Ecuador and I am from the U.S so I never really knew how to prepare a authentic Ecuadorian dish until I found your website. And like the other’s we live in Ohio so no Ecuadorian restaurants around here only Mexican. I have made the guatita over two years ago but I pretty much guessed how to make it winged it and threw in my own ingredients (it turned out ok)but I am thrilled to finally have a recipe to use. It was hit. I agree with the other girls you should publish a cook book your stuff is great. Gracias, Laylita! I grew up with this food, but no one ever wrote the recipe down and now I have a way to try and make it at home, too. I really believe you should publish a cook book, you are very talented! Thank you so much!! Finally, I learned how to cook this dish. My hubby loved it! After several years of living in Quito, it was a revelation one day when a friend’s mom told me she could prepare guatita “sin guata” so I could try it (I’m a vegetarian). I never realized that she only added the guata just before serving. Since then, I’ve been hooked. I’ve tried adding tofu to give this delicious dish some protein, but my favorite way to do it is to add chunks of hard-boiled egg just before serving. The egg tastes great with the creamy peanut and potato sauce. Not the most authentic version, but that’s MY “guatita sin guata.” Thanks for showing Ecuadorian cuisine in all it’s glory, Laylita! Laylita gracias por la receta de mondongo es riquisima con la salsa de cebolla roja. I haven’t made this dish in such a long time but since I am not able to find any Ecuadorian restuarants in DFW Texas i thought I would bring a little peice of Ecuador home for my hubby! He loves guatita and hasN’T been able to go to Ecuador to visit. I browsed looking for a refresher recipe to assure I would make it correctly but you have add some ingridients that I have not used so I am super excited to try it your way! I looks YUMMY! Love the site, it is very helpful!!! Your recipe was quite clear. My husband is ecuadorian and this is his favorite dish. We live in Kentucky and I haven’t found tripe. However (for any vegetarians out there…. )my son is a vegetarian, so I’ve been experimenting with different ways to prepare tofu. I adapted the guatita recipe with tofu. I saute the refrito and potatoes together. Mix the peanut (natural peanut butter with no sugar) and milk, sprinkle in achiote (thank you Mexican stores), add salt and cumin to taste and waaa laaa. Oh, I marinade tofu in soy sauce, worcesthire sauce, salt and pepper previously, then cut into cubes, bread and saute, then toss into the pot. Nummy. If you are not too keen on tripe, you might try this nutritious dish! My favorite dish has always been “Guatita” and it was amazing when my mom made it…. Never learned how to make it and I’m glad I tried your recipe, it came out great…. I will be making it more often… Thanks again! It’s is so good!!!! My family love it. I wished I have seen this website years ago. When I was pregnant I craved for this dish! My poor husband would take me from the Inland Empire area to a restaurant in Hollywood/Los Angeles area, very hard to find an Ecuadorian restaurant. I am so excited to try it andhave my baby try it! HIya all;I’m from Guayaquil; and this is one of my favorites dishes, i’m gonna cook this recipe for my Venezuelan wife tomorrow, i’m pretty sure once she sees this dish on the table as in the pictures i’ll get some extra points!! I am English and lived for many years in Guayaquil and then worked for Banco del Pacífico in London for ten years. Guatita is my favourite main dish recipe from Ecuador – have a ceviche de camarones first, then the guatita. Heaven! We are lucky here in England as we are able to obtain tripe cleaned and prepared for cooking. So guatita is fairly easy to prepare as all the other ingredients are readily available in our local supermarkets, even achiote. If tripe is cleaned EXTREMELY WELL it does not have a gross taste or smell to it. I would definitely clean it with more than half a lemon. Just my suggestion. I am from a Hispanic background and my Gram and Aunts all make menudo and we never have this problem, but then again, we clean it EXTREMELY WELL. this is a cool website. i am ecuadorian. and i am on this website becuase my spanish teacher is making me bring a recipe of my favorite dish tomorrow. and since i am half ecuadorian i am going to bring in a recipe of Guatita. P.S. if anyone loves ecuadorian food. then go to new york city. there is alot of ecuadorian restuarants. and they serve guatita and lots of other ecuadorian food. my opinion is go to jackson heights queens. thats where u can find all the ecuadorian restuarants. I agree! Was in Queens, NY for Christmas and ate at the food truck. Encebollado, ceviche, seco de chivo, Quaker, Morocho. I love it all! A colorful dish which might reconciliate myself with tripe! It looks gorgeous! yum, guatita is the ONLY way I like tripe!